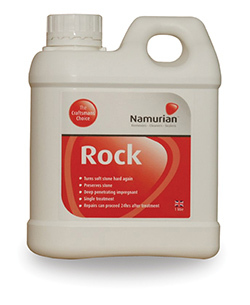 Namurian™ Rock is a professional grade stone consolidant that is used in the restoration of decaying and friable stone by restoring strength and stability by chemical means prior to repair. Stone repairs can typically proceeed 24 hours after treatment. The product can be used as a preservative for natural sandstone and limestone and will help to conserve delicate masonry. Rock (500ml) 500ml will cover approximately 1.5m². Rock (1 Litre) 1 Litre will cover approximately 3m². ©2019 Stone Tech (Cleveland) Ltd. All Rights Reserved.